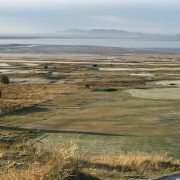 The 2017 Babe Zaharias was played at Gullane No1 and while there was early morning mist lying on the course at the start of play it soon burned off from most of the course thought it lingered at the 13th and 14th for a bit longer. For a change there was no wind and no rain and by the standards of this summer almost perfect golfing conditions! We had some almost perfect golf too with the winning scratch scores of 75, 76, and 77. A net score of 73 was not enough to secure a place in the handicap prize list with multiply scores of 73 and countbacks were required to determine all three places. While others were less successful they still seemed to enjoy the day judging by the smiles captured by Joyce on the course and the laughter in the clubhouse. There were lots of promises to return next year to play at Luffness the next venue for the competition. The final figure raised for Macmillan Fund will be known shortly but it will exceed the £3,400 raised last year thanks to the support of Gullane GC and Lindsays and the many organisations and individuals who donated prizes and the team of supporters who helped us run the event. As some of you will know the Autumn Meeting at Haddington on Friday had to be abandoned when a torrential downpour following on all the earlier rain flooded the greens and we were advised that play could not continue. We have re-scheduled the event for Tuesday 26th September. Unfortunately there will be no late tee- off times since the days are too short by that time of year. We have a block from 8.30 – 2pm. If you were entered for the event yesterday and wish to play in the re-scheduled Autumn Meeting please email to ellcga2@gmail.com Your payment and Two’s Sweep money will be rolled over to the new date. We will as far as possible allocate a time within half an hour of your original time but you will appreciate that some re-jigging of the draw will be required. Times are likely to be earlier than today. If you need a different time please let us know. The closing date for this competition is 5pm on Monday 18th September. If you were entered for the event and cannot play on the new date please let us know on ellcga2@gmail.com and a refund will be sent for your entry and where appropriate the sweep. If you were not entered but wish to play on the new date please let us know at ellcga2@gmail.com and also let us know your preferred tee off time slot. Payment will be accepted by cheque or bank transfer. Please note the online booking system will not be used for this re-scheduled competition. It would be very much appreciated if everyone who was originally in the draw could respond by the closing date of 5pm on Monday 18th September. Fingers crossed for better weather next time. Congratulations to Gullane who have just played Castle Park and won 4-1. This win means they have secured the trophy again this year.well done to all the players in all the teams and hope you all enjoyed the matches you played. The trophy will be presented at the AGM. We are now accepting entries for the Winter Foursomes Competition which will run from 1st October 2017 to 31st March 2018. All that is required – the two names for the pairing and the contact number or numbers. There is no form and no entry fee. All results should also be notified to Frances in due course. Please submit your entry on or before 16th September 2017. The draw will be made very quickly thereafter and posted on the website. If you enter please remember to check for the draw! Our members are busy golfing in many different places at the moment some locally and some further afield. This is a quick round up of some of those involved in International events. Two of our members have been seeking pastures new. Lesley Johnstone and Sue Penman have played abroad with some success in the past but this year decided to take on an different challenge and entered The Scandinavian Senior Ladies Open held on the Lakes Course at The PGA National near Malmo in Sweden. Over 6 days they played in first the pairs where they runners up followed by singles stroke play where Lesley finished 7th and Sue 8th. This was a against a high quality field with the Swedish players in the field playing for places in the national team. Two of our Juniors Alicjia Gorka and Grace Crawford join an international field for the Loretto School Scottish Boys’ & Girls’ U14 Open Championship to be held this week at Crail.ngood luck girls. Well done to Renaissance and North Berwick who have won their sections of the Carols’ Trophy. The final will be played at Longniddry on Sunday 10th September at 12.45 – 1315. Many thanks to Longniddry for hosting the event. The presentation of the trophy will follow the matches. Good luck to both teams. Supporters most welcome. We are delighted to report that we have a full entry for the competition again this year and look forward to welcoming you all to Gullane on the 21st August 2017. Please click on link below to see the full draw and information for players. As some off you may have already heard Caryl Campbell died peacefully at the Muirfield Nursing Home on Friday 28th July. Caryl was the longest serving secretary of ELLCGA having given 17 years to the role culminating with our 75th Anniverary. More recently she held the roles of Vice-President and President adding a further 6 years in total to her service to the County. Caryl was for many years ‘East Lothian’ both within East Lothian and in county golf generally. No event involving ELLCGA would be complete without Caryl. The County was a great source of joy to Caryl who valued the fun times and many friendships she made through her involvement with the County at all levels. She also took great pride in the County and in representing the County at various events over the years. During her time as secretary Caryl was concerned that ELLCGA lacked a badge or logo when all the other Counties seemed to have one. At Caryl’s bidding her late husband Ian came up withe the familiar wheatsheaf design that you will see on this website and on all our County clothing. Caryl suffered poor health in recent years but even after the first of her strokes she was still the perfect hostess and loved to recall the excitement when individual players and the team encountered such success in the 1990’s and the fun she and they had. Caryl will be much missed by all who knew her. We had an opportunity at rather short notice to nominate a junior and reserve to attend an event at the Scottish Ladies at Dundonald on the 26th July 2017 for a behind the scenes tour, group watch of a professional in the pro-am, Q&A and to meet various professionals. Emma Chapman and Grace Crawford our junior handicap and scratch champions were nominated and both got to go and had a great day. Emma was so inspired by the day that she was out practising her golf at 6.30am the next day!